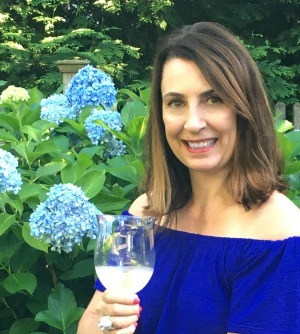 Endless Summer Hydrangea Hedge & a Giveaway! If you’re looking for me this summer, you’ll probably find me on my patio. July is prime blooming season and I love being surrounded by a sea of gorgeous hydrangeas. Kelly and hydrangeas go together like peas and carrots so partnering with Endless Summer® Hydrangeas is a no brainer for me. 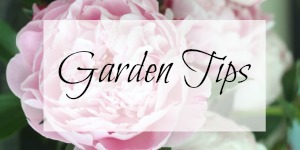 Gardening involves lots of trail and error so I’m passing on some of my tips so you can have more success in your garden. Just like real estate, it’s all about location, location, location when it comes to planting hydrangeas. They prefer a few hours of morning sun with dappled afternoon shade and they thrive in my backyard. They are planted right by my house so they get lots of shade when the intense afternoon sun is blazing. Depending on what part of the country you live in is also a factor when choosing the perfect spot for your plants. I live in NJ so my blooms can handle more sun than southern states. 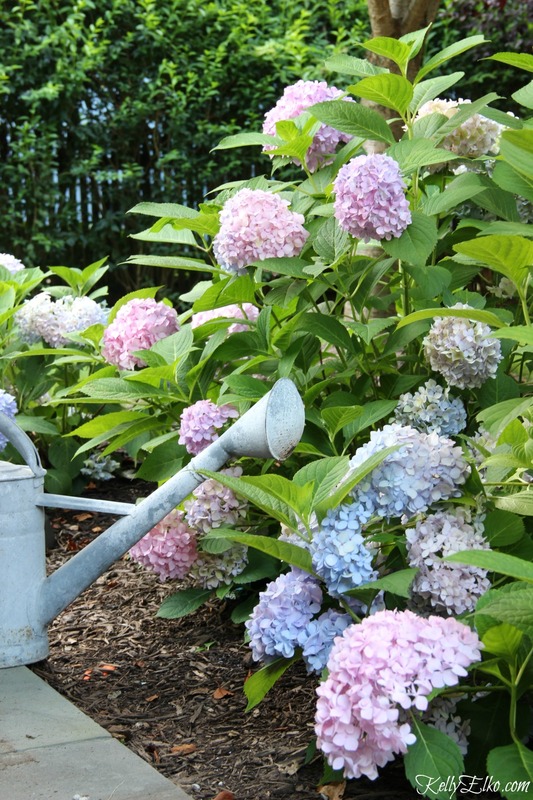 Did you know that overwatering can cause hydrangeas to produce less blooms! Your soil type will determine how much and how often you should water. Clay soil holds water and will not need to be watered as frequently as sandy soil. 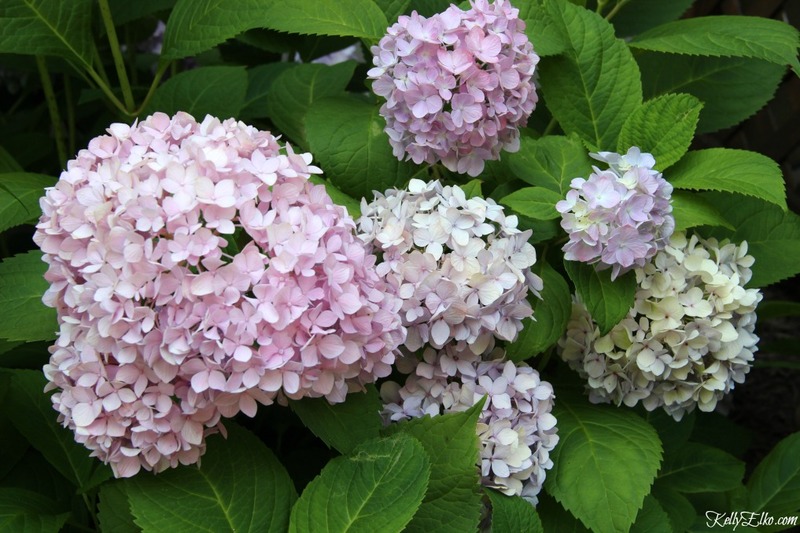 When the temperatures soar, you may notice that your hydrangeas wilt in the afternoon. That is perfectly normal but they will perk back up when the temps cool down. I like to water in the early morning or early evening (I set the timer on my sprinkler system). If you don’t have a sprinkler system, use a soaker hose or water by hand. Make sure to mulch around your plants so you can water less frequently. « Previous: Meural – 30,000 Pieces of Art in One Canvas! I love my hydrangeas too! Thanks for the chance to win! Thanks for the great giveaway and always helpful tips!!! My pleasure and fingers crossed for you Brenda! What a great giveaway! I too love the Endless Summer hydrangeas. I really like how the colors are different in my front of the house (blue) from the back yard (pink) due to different soil conditions. Thanks again Kelly! I love that too Denise! Your hydrangea are beautiful, Kelly! Fun giveaway…I would love to win! Your hydrangeas are so pretty! I always love your hydrangea posts! I finally bit the bullet and planted some this spring! Great news – enjoy your blooms! What a lovely post! I love those photos. And thanks for the generous giveaway! Thanks Vicki and good luck! Love hydrangeas! Thanks for the tips! Thanks Colleen and good luck! Love your comments can almost feel myself sitting beside you enjoying your beautiful hyrandges! The information on care of hydrangea was very helpful as I recently purchased a plant. Cheers Pam – raising my glass of rose’ to you! Wish I could join you on your patio for a glass of Rose’! 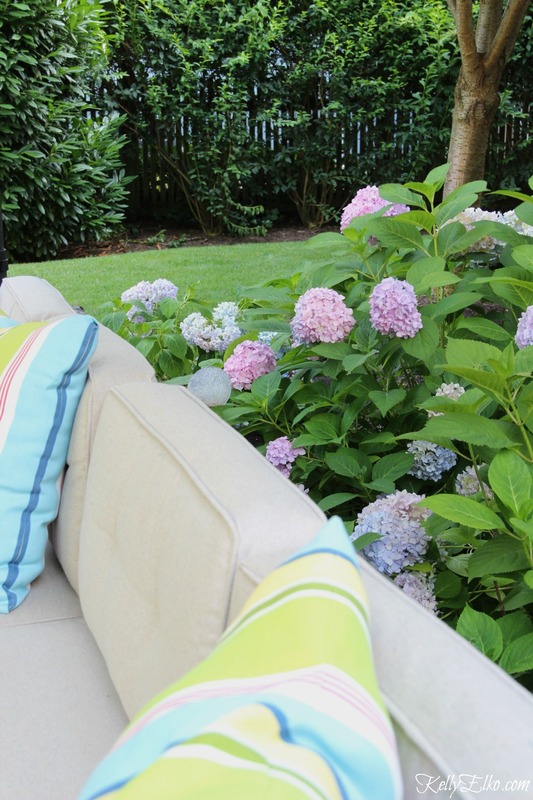 Your Endless Summer Hydrangeas are gorgeous! I appreciate your simple direct information and directions about the hydrangeas. Thanks also for tip about Pandora. I am moving into a new home in Indiana. Would these work on the south side of my home under an overhang that should block hard direct afternoon sun. Thanks. Love your site!!! I’m not sure Jerry. Southern exposure isn’t ideal but if you think you have enough shade, they could work. Thanks so much Cyndi and good luck! Your patio flowers are beautiful!! The hydrangeas are gorgeous. Sadly, they don’t grow in my part of the country. thanks for this giveaway. I love my hydrangeas, but I do have one bush that hasn’t bloomed in 4 years or so. ugh. its one of those lace=types. I love your stuff, so thanks for sharing!!! Angela from NJ, down the shore!!! Great giveaway!My Endless Summer Hydrangeas are blooming like crazy! Love them!! Great news Susan – enjoy your flowers! Thanks so much Katy and good luck! These would be an awesome addition to my yard in Middle Tennessee, they seem like they are in bloom here for such a long season here! Love…love…love!!! Hydrangeas are so beautiful! Thank you for the giveaway. Thank you for all the tips regarding hydrangea. I am trying my hand at gardening since moving to Georgia from the harsh winds of Dallas, Texas. I fear I have made a few planting mistake but you give me great tips on growing my favorite plant! Gardening is a lot of trial and error. Don’t be afraid to move your hydrangea in early spring if it isn’t doing well this year. Thanks Pat and good luck! Thanks for sharing helpful tips on hydrangeas. Yours are so beautiful. Nice give away! Thanks Carolyn and good luck! So, that explains my fascination with Hydrangea! It’s all in the name, I am a Kelly too and this is my season too! I’ve been amending my clay and rocky soil with organic matter for many years to get anything to grow and it’s really paying off, but it took a long time. I have to be careful in certain areas because the clay tends to hold onto the moisture and I have killed quite a few plants with kindness. Your blog is wonderful and fun. I’m always happy to meet a fellow Kelly! My mom had a green thumb but we didn’t have hydrangeas in my yard when I was a kid – I’m making up for it now! I ADORE hydrangeas–esp. the endless summer variety. Thanks for sharing. Love the Hydrangeas! I am already trying to think of the best place to plant them next spring, I have been afraid that they would be hard to grow, but you have inspired me. Thank you for your posts. One inspired me to save my Dad’s old typewriter. I’m glad I did it reminds me of him when i see it – happy memories. I’m glad you’re inspired Kathryn and that you have your dad’s old typewriter! Hi. I have been following your blog for at least a year. I love your eclectic, fun style and always inspired by it. Thanks for all of the great tips. I too have a hydrangea that has lots of great blooms for the 1st time in years! I’m so happy. Happy Summer! I’m so happy for you Denise and thanks so much for reading my blog and leaving such a sweet comment! Thanks for the hydrangea tips! Now I know what I have done wrong in the past with my plants! Thanks for the info! I love Hydrangeas! I wish I would have had them in my wedding! Now I want them planted everywhere in every color! I love the 2 tone ones too! I live in Ohio so I am not sure how well they would fare but I would love them and care for them like I would a child. I lived in Ohio for 4 years (Dublin) and planted hydrangeas there. Go for it! Great Hydrangea tips, I have enjoyed my Hydrangea for years. Love hydrangeas. I get a lot of sun but think they would do ok in my front yard. Think I’ll get some this week! What beautiful flowers and generous opportunity to win a lovely gift. Thanks! I love hydrangeas, too! They just can’t be beat for cut or dried flower arrangements. The Endless Summer ones are beautiful. I can’t wait until we have a shady area so I can finally, finally plant hydrangeas! I love them so! I would so love to see some actual flowers on my hydrangeas planted 8 years ago!! Can’t bear to give up on them even though hubby says to give it up! Oh my goodness, what a great article on Hydrangeas. I also am blooming with excitement for a chance to win. Such beautiful images. I’m updating the front of my house and trying to decide what to plant – hydrangeas might be a nice option. 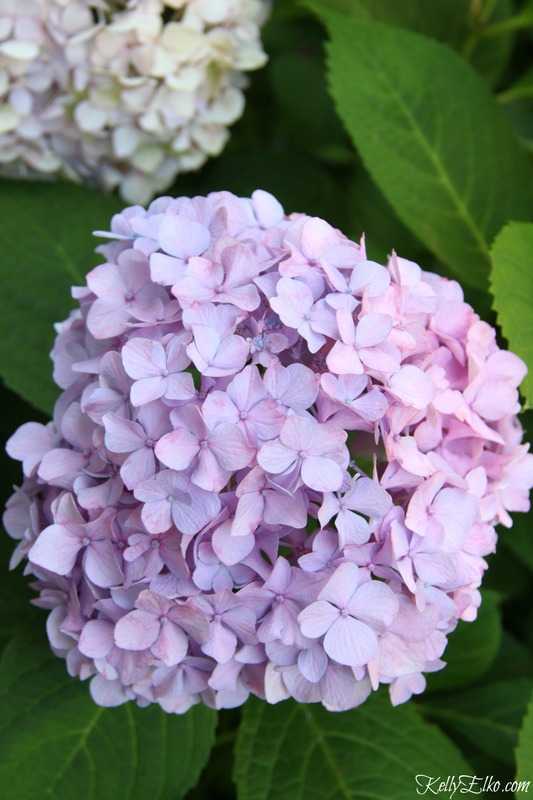 Thank you for the tips….I love hydrangeas! They are my absolute favorite! And thanks for the chance to enter the giveaway! I would love to win this giveaway! Edison bulbs are my favorite lights! I’ve been thinking about jumping into planting hydrangeas but I live in South Florida and we are very humid and hot! So Ive been a bit timid about it. They do sell them at my local Lowes so I think I’m inspired to try them! I love hydrangeas! I have an oakleaf and a variegated one my mother in law gave me and so far they are doing well! I can’t wait to be at the farm full time! I’d love to have lots and lots of the Endless Summer ones! Goodness, but the pictures of your hydrangeas are just beautiful! I’d love the chance to win. I’m going to listen to the Pandora station as well! Thanks for sharing. Oh my goodness!!! I’m super excited that I came across your blog!! Just b what I was looking for you help me grow my love for hydrangeas!!! I’d love to win the amazing giveaway—just the things I need and want!!! Thank you! I love hydrangeas. I live in Western NY and backyard is very wet in some spots. Do you think endless summer hydrangeas would work in my yard? Not sure Karen. I would visit your local garden center with some photos of your yard. They should be able to help. But I do know that hydrangeas don’t like sitting in water so I don’t think it’s your best option. I am becoming a huge fan of hydrangeas and recently planted some! Thanks for the helpful hints!! Endless summer is a perfect description of how I feel when I am relaxing in the shade and enjoying the flowers in my yard. your flowers are so beautiful! I wish I was a better gardner. I just either over or underwater everything.My current flower beds are a hot mess! I enjoy your flower tips and of course all those gorgeous pics. Now if I could get my 6 month old to nap long enough to garden..
LOL Hope! With a 6 month old, I would not get much gardening done either! They are gorgeous! I would sit sipping wine staring at them all the time too if they were in my yard! I only have a small garden area and have some hydrangeas in a pot. You always share helpful tips and I love your links! Thanks so much for the chance to win your giveaway! I love the color of hydrangeas! They make every yard and garden look fabulous. Thanks for the chance to win. I love hydrangeas, any color. I have 5 and would love more. They make such wonderful dried arrangements. I would love to have the endless bloom hydrangeas. I can’t get enough. Please chose me to win this beautiful flowers. These are just beautiful. I would LOVE to have one! 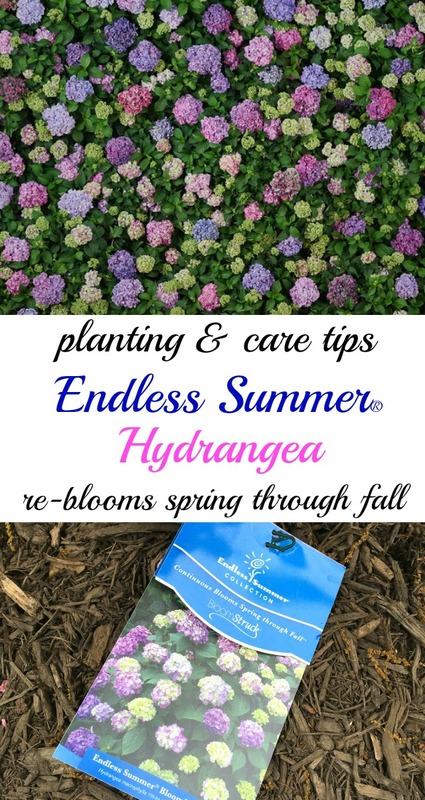 Great tips!Your Hydrangea’s are stunning! Love the tips on caring for these bushes. I am going to buy a plant next summer. Thank you. I love Hydrangeas ! It would be fabulous to have them bloom all summer. Happy to read your post, Hydrangas are my most favorite of all time!! I have wanted to plant hydrangeas. Would Love to win yours. Thank You. would love to have a cutting of this plant. Love gardening. I would some extra tips. My favorite flower, having always favored the blue ones ! First thanks for the giveaway. I have an endless summer, blue . I luve all hydrangeas… and all flowers. Hope I win. Endless Summer Hydrangeas are my favorite plant! Thanks for the tips and info. I learned that I am probably overwatering mine. ? Just discovered my first endless summer hydrangeas. Can use all the help I can get so it will thrive! I finally have one little one growing. Love them but they don’t love me. I’ll keep trying. My favorites are hydrangeas yet I have never tried this variety. They look beautiful. Next give a lesson on how to dry them. I’ve never been successful. I ? hydrangeas they are my most favorite flower. 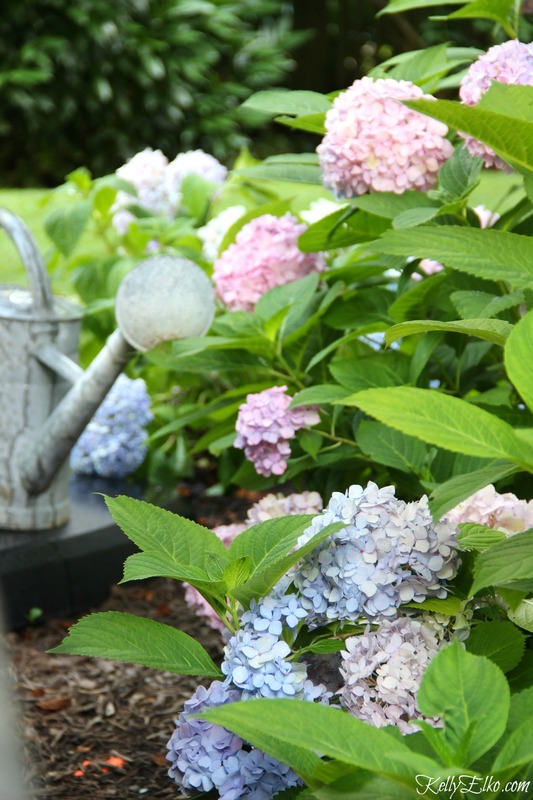 Thank you for the tips….love my hydrangeas!!! I have several unnamed hydrangeas. Will they need the same care – planting site, watering, etc. – as Endless Summer hydrangeas? I have the perfect spot for one!! I love hydrangeas!!! Unfortunately so do the deer that roam my yard. I will be moving to another town soon and will be looking for a new home that will house an abundance of flowers. Have never grown this variety, I have peegee and lacecaps. Like the constant blooms! Oh how I love hygrengas!! I just wish they would grow better at my house! Hydrangeas are my absolute favorite flower…always so gorgeous! I’m glad to learn about these, thank you!!! ? I am so totally in love with hydrangeas and I have a big one that produces all colora which I am constantly cutting to put in vases in our home because they are just so beautiful! I certainly would love to have more! Thank you for the chance to win!!! Thanks for the tips! I love my hydrangeas too and would love to win your give away!!! Beautiful hydrangeas! Thanks for the great tips! I absolutely love your post on one of my favorite flowering plants. Cannot wait to see more of your helpful info! I do love hydrangeas. Gardening gives me peace. Thanks for the opportunity to win. Happy August to you. I love my Endless Summer hydrangea but the blossoms seem to be smaller this year. Do I need to fertilize? I would love this fun giveaway! Thanks for offering the chance. Would love to win something in the giveaway! Hydrangeas are my favorite flower. These Hydrangeas are beautiful! Did you start them from seed or a plant? Thanks for sharing your knowledge of plants. Ohhh, how I love hydrangeas. I have 2 Endless Summer varieties. I collected 35 blooms to dry a few weeks ago. That’s my best harvest in a few years. Great tips. I need to get the texts, do you know if they are specific to your zone? I have one Endless Summer and absolutely love it. Blooms just keep on coming. I cut my hydrangeas back in the spring and now they are not blooming at all this summer should I have not cut them back. Hydrangeas are my most favorite flower and so many exciting colors to choose from! Hydrangeas are my favorite! (I just bought my fifth one today.) Thanks for the great giveaway! Thanks for the tips! & a chance to win ! Thank you for sharing your knowledge! Look forward to more! I’ve been a hydrangea failure for YEARS. Every one I have planted has failed — until last fall, when we put in a new garden, and I gambled and tried again. Voila! My first baby, er, I mean hydrangea! With beautiful blossoms!!! I’m so excited I keep chattering about it to my garden-loving sisters and Mother. I now have the courage to plant more — and that’s just what I’m going to do. Thank you for the TIPS! I can see I need an Endless Summer Hydrangea next! Neat giveaway. Count me in! I love hydrangea…I live in NJ too, I have 2 plants in front of my house, for the last 3 years I get beautiful foliage and NO flowers, can you tell me what we are doing wrong…we prune them back in the fall…thank you for the chance to win this great giveaway! Great advice! Just moved to a new house with hydrangeas and was wondering how to care for them. They need some love. Love the Hydrangea helps. The problem with letting mine wilt till the Sun is off, are the wilted bracts burn. I lived in the central California Foothills, and it gets hot! My favorite hydrangea for my area are the Limelights. I have four and they are tougher than all the others. Many thanks. The prettiest things I’ve ever seen! Love! Thank you for all the tips. I would love to have one of these beautiful flowers to add to my garden. I would love to be able to raise some of these beautiful flowers and maybe with your guidance I can. I would be honored to win any of the above giveaways. Thanks for the hydrangea tips! I think I need to move mine, too much midday sun. Thanks for the chance to win. These are absolutely breathtaking, my husband and myself bought a cornfield to build our house on. Well its taken some time but its looking more like a yard and less like produce. These flowers would make a wonderful addition. Sign me up!!! Love, love, love hydrangeas!! I love hydrangeas and to find one that blooms all summer is fantastic. My hydrangeas plant is huge but I have no blooms. What am I doing wrong? I’m so excited to learn more about hydrangeas. I’ve been very good at growing them so with your help I hope to have beautiful blooms next yr.
Beautiful. I just got my first hydrangea this year. These plants are absolutely breath taking. I love them. I would love to win this for my 70 year old sister that has a birthday coming up. She almost died from a misdiagnose sickness she had, thanking God she’s ok. She loves flowers this would be the ultimate gift for you. Beautiful flowers for sure. This is probably my favorite flower. Not sure where to plant in the deep South but I would love one or fifty. Love hydrangea’s!! Would love to win!’ ! I will look for endless summer. I only have one hydrangea & every year it gets very healthy leaves but no flowers ? It’s 3 yrs old. Bloomed once. Keep hoping though ? Hydrangeas…my favorite flowers in the garden! Lovely! I would love to try these endless bloomers. Love the beautiful hydrangeas. They remind me of my mothers. She loved them and her back yard was always blooming with them. Hydrangeas are my favorite summer shrub! They are awesome!! Would love to win some!! Love these flowers. Would love to win some. Love your hydrangeas. Would love to have them blooming all summer. I love endless summer – beautiful and unique. How late in the year can you plant them I haven’t planted any yet. The area I was going to plant gets a lot of sun would regular hydrangeas do better? Thanks for the tips! I was wondering if the slight wilting is okay. My hydrangeas didn’t bloom this year. Any suggestions? My hydrangea did not bloom much this summer but now I know I may be overwatering. Thanks! i love hydrangeas, I need to put some in my yard. Thanks for the tips.